Pohnpei, FSM—Three time US Olympian and silver medalist in volleyball, Heather Bown visited Pohnpei and Chuuk under the auspices of the US Sports Diplomacy program. “Sports diplomacy uses the universal passion for sports as a way to transcend linguistic and sociocultural differences and bring people together. Participation in sports teaches leadership, teamwork, and communication skills that help young people succeed in all areas of their lives,” the website of the US’s Bureau of Educational and Cultural Affairs says. Bown certainly accomplished that mission while she was in the US, spreading her own enthusiasm for sports to hundreds of people in the FSM as she visited schools, local coaches, and government representatives. In addition to having been a key player on the US Olympic volleyball team during three Olympics games, Bown also was a professional player with experience on teams around the world. She brought a wealth of enthusiasm and inspiration to the FSM. She arrived in Pohnpei on March 23. 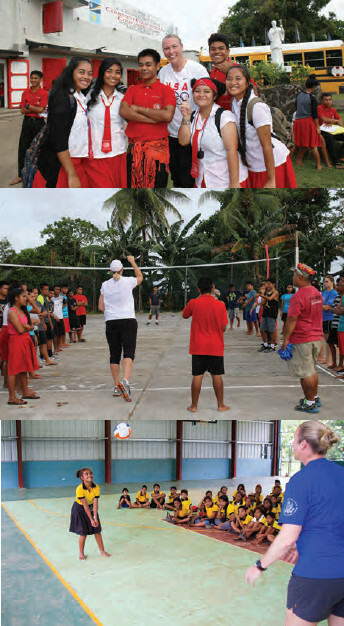 On the next day she conducted a workshop with Pohnpei State volleyball coaches and athletes. In the afternoon she shared a health and fitness speech with the seventh and eighth grade students of Kolonia Elementary School and did an interview at the State radio station. In the evening, US Charges d’Affaires Joanne Cummings held a reception at her home to introduce Bown to leaders in the FSM. On Saturday she gave a well-attended free volleyball clinic that was open to the public at the PICS gym where she taught the fundamentals of volleyball to people of all ages. On Monday, March 27 she continued her workshop with local coaches before taking her message of health and fitness to the students of Our Lady of Mercy Catholic High School. She gave another coaching clinic at the College of Micronesia FSM-Pohnpei Campus in the afternoon. She paid a courtesy call on FSM Secretary for the Department of Education, Kalwin Kephas on the next morning followed by a health and fitness speech at Sekere Elementary School along with some demonstrations of volleyball technique. She also visited Nanpei Memorial High School that afternoon. During her speech, Bown spoke to students not only about the importance of healthy lifestyle choices but also about achieving their own goals. She used the acronym, “SMART” when she spoke of good goal setting. SMART goals, she said, are Specific, Measurable, Achievable, Realistic, and Time- Based. While in Pohnpei, Bown also had opportunity to visit the World Heritage site, Nan Madol in Madolenihmw and spent some time at Kepirohi Falls as well. Before departing for Chuuk, Bown was able to participate in the COM Founding Day activities as well. She arrived in Chuuk in time for FSM Cultural Day hosted by the Chuuk Women’s Council. In addition to being able to participate and observe all of the activities of that day, she also gave a health and fitness speech to the gathered crowds. On the following day she presented a volleyball clinic for State coaches and athletes at Saramen Chuuk Gymnasium. Sunday was left for a bit of well needed time off and exploration in Weno. On Monday, April 3 she visited Akoyikoyi School and Chuuk High School. Wherever Bown went in the FSM she was received with enthusiasm. She has spent her adult life traveling the world in a way that most tourists don’t have the opportunity to do. Wherever she has gone, she has immersed herself in the culture of the people where she is. A US Embassy official said that she was surprised at the number of people in Chuuk who knew her from her days at the University of Hawaii where she studied on an athletic scholarship. Bown was born and raised in Southern California but is now living in Southern Florida. With the US Olympic team, Bown competed in the Olympics in Sydney, Australia in 2000, in Athens, Greece in 2004, and in 2008 in Beijing, China where the US Women’s team won a silver medal. She retired from the US team in 2012 after being named as an alternate for the Olympic Games in London. In between summers competing with the US National Team, Heather enjoyed an adventurous professional career. Beginning in 2000 and spanning 14 years she was fortunate to live and compete in Italy, Turkey, Azerbaijan, Russia, and China. During a lunch interview she spoke with passion about her many volunteer activities as well. She volunteers for Classroom Champions; Ready, Set, Gold! ; ACE Mentor Program, and the United Way. She is constantly focused on sharing her love for sport, the joys and lessons it brings to life, and a desire for personal growth. She enjoys working with youth and helping them realize and maximize their potential in the classroom and on the field of play through coaching and mentoring. She still sets SMART goals. After having mastered Italian, Heather’s current personal goal is to learn French by next year before she visits. The US could not have asked for a better Sports Diplomat for the FSM.